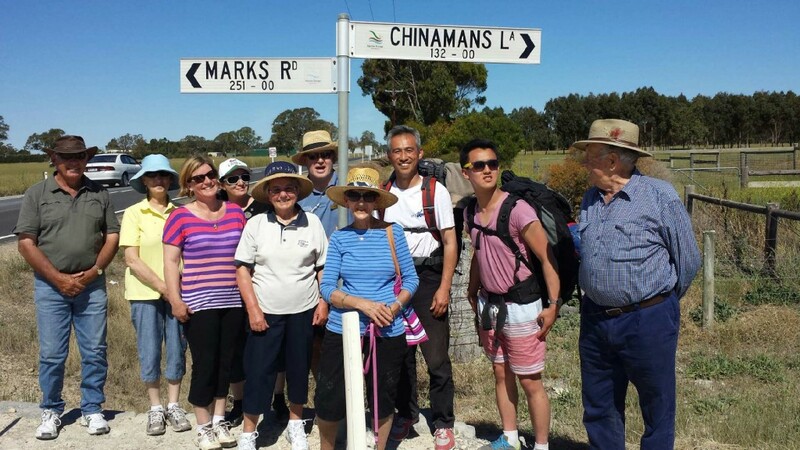 On the 15th of December 2013, Charles Zhang and his son Oscar will begin to retrace the footsteps of the Chinese prospectors, who travelled from Robe in South Australia to the Victorian Goldfields. The re-enactment is planned to take 15 days, with Charles and Oscar travelling approximately 35 kilometres per day. 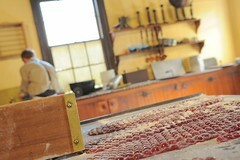 Before they leave Ballarat on their way to Robe, Charles, Oscar and Bill Moy visited the Chinese Temple at Sovereign Hill to ask for permission and good fortune from their ancestors during their adventure. 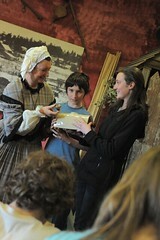 Their walk from Robe to Ballarat will also end at Sovereign Hill on Saturday the 28th of December. Charles Oscar and Bill are all members of the Chinese Australian Cultural Society of Ballarat (CACSB). Interestingly they represent different generations of Chinese immigrating to Ballarat. 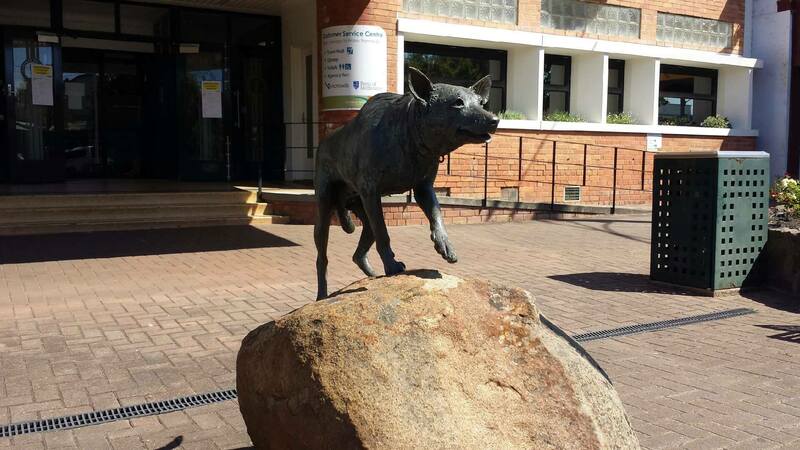 Bill’s Ancestors came to Ballarat during the Gold Rush. Charles and Oscar represent more recent arrivals to our city. 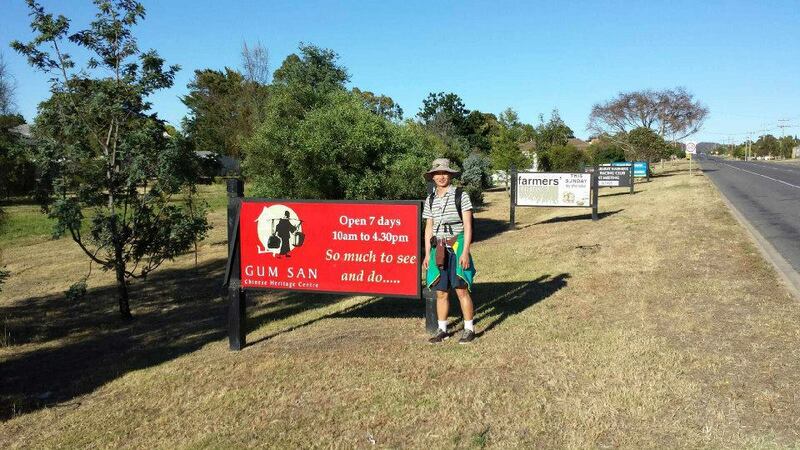 The Aim of the walk is to follow the route taken by the Chinese miners. 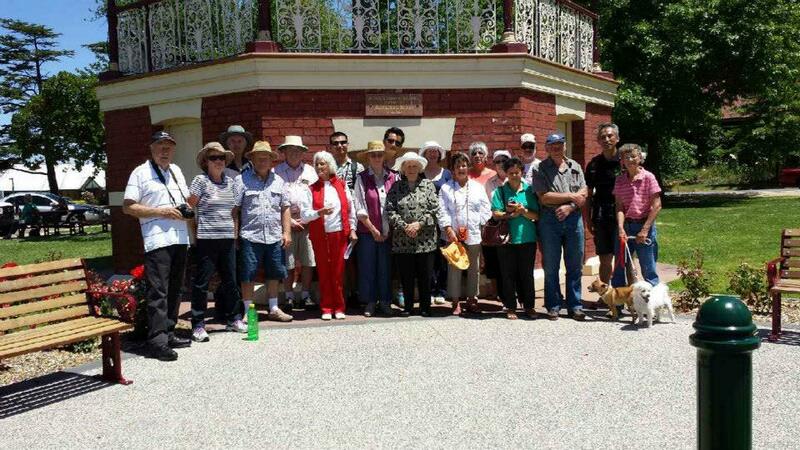 Oscar and Charles will commemorate the contribution made by the Chinese gold diggers on the Central Victoria Goldfields, while promoting rural Australian towns and cities. 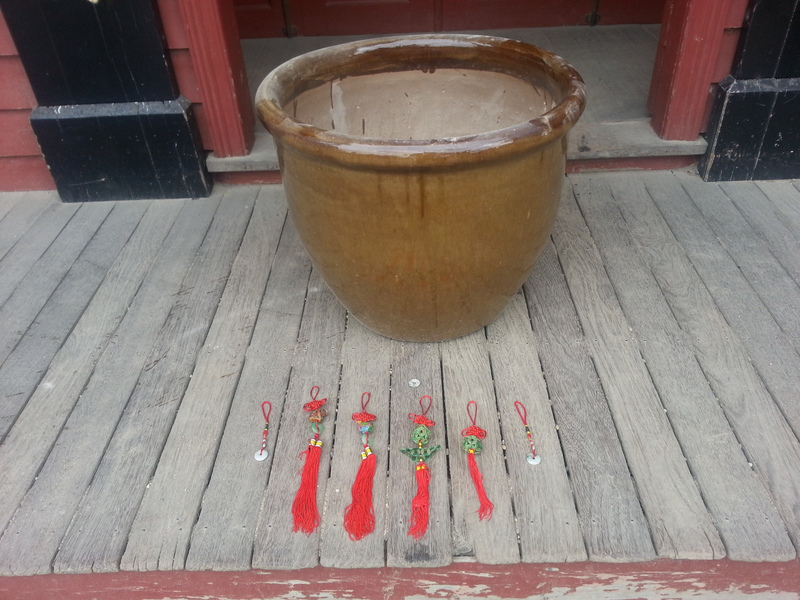 Pot for Incense burning with Jade talismans and a coin given to Charles with links to the Avoca Goldfileds. These will be carried on the journey. Regular details, stories & photos will be posted on the Chinese Australian Cultural Society Ballarat website: www.chineseballarat.org.au and Ballarat Community Radio Station 99.9 Voice FM: www.voicefm.com.au. We will also attempt to keep this post updated with information about the progress of the walk. So keep coming back to follow our intrepid adventurers on their special voyage. 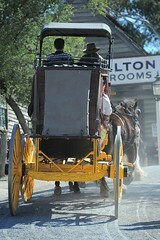 Charles and Oscar have begun their walk from Robe, and on their way back to us at Sovereign Hill. No reports of Blisters yet, but flies seem to be very friendly. 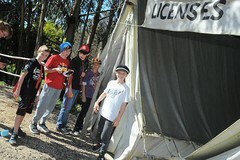 We have received some photos from the intrepid trekkers and have posted them below. 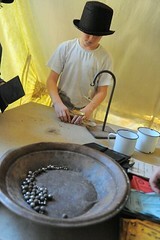 keep an eye on this blog as well as www.voicefm.com.au and www.chineseballarat.org.au. 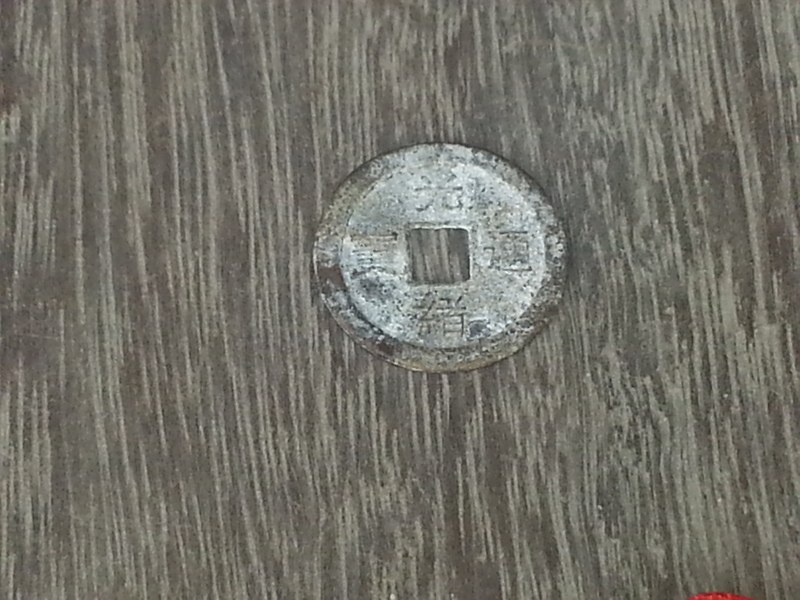 Lucky day – first day! 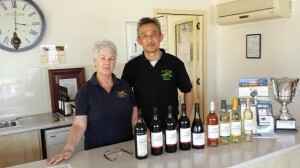 Met Larraine Falkner, the owner of Karatta Winery. She knows a lot of the history of Chinese walking past the property in the 1850s. She even knows of a well dug by Chinese to drink fresh water when they stopped there. Check their website and go and ask for more of her stories. Charles and Oscar arrive in Penola. Met people from Penola lead by Councilor Robert Thomas and historian Evelynne Bowden at Chinamans Lane where there used to be the Charles Market Gardens initially supplying vegetables to Chinese walking past there. A local newspaper The Border Watch has an article on Sat 8th Aug 1885 of Chinese gardener Tam Wan, his cart ran away with horse, or vice versa. The cut on his head and sundry bruises sufficient to keep him under medico’s for a few days. Well while we had some time off for Christmas, our intrepid trekkers completed their journey, now we will catch up with their amazing journey. Of course you can also read about their adventure at the Chinese Cultural Society’s website. 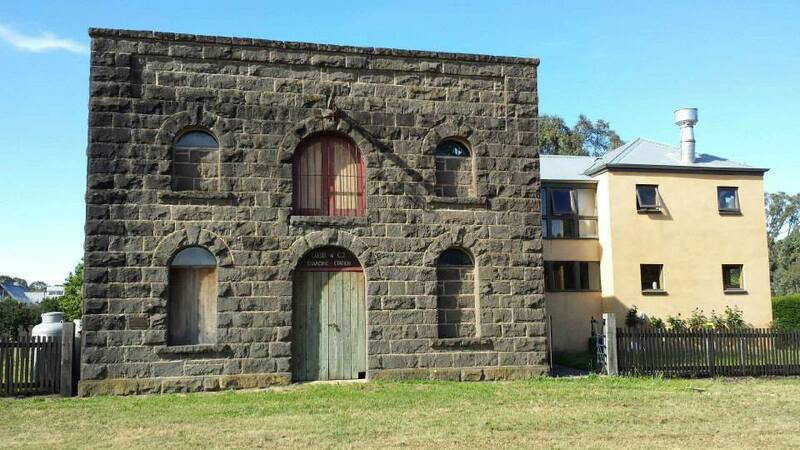 The boys made their way to Casterton, the “birthplace of the Kelpie”, through 38 degree Celsius temperatures. Oscar described it as like walking through your oven. The next day the boys walked to Coleraine, where Charles found he had to stop and take a picture of a certain building. 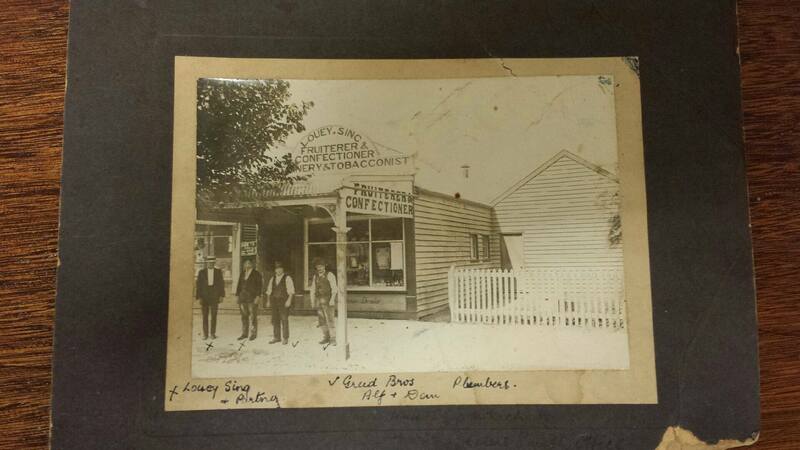 After talking to the local historical society, it turned out to be the building next to a Chinese fruit shop, which was demolished in 1985. 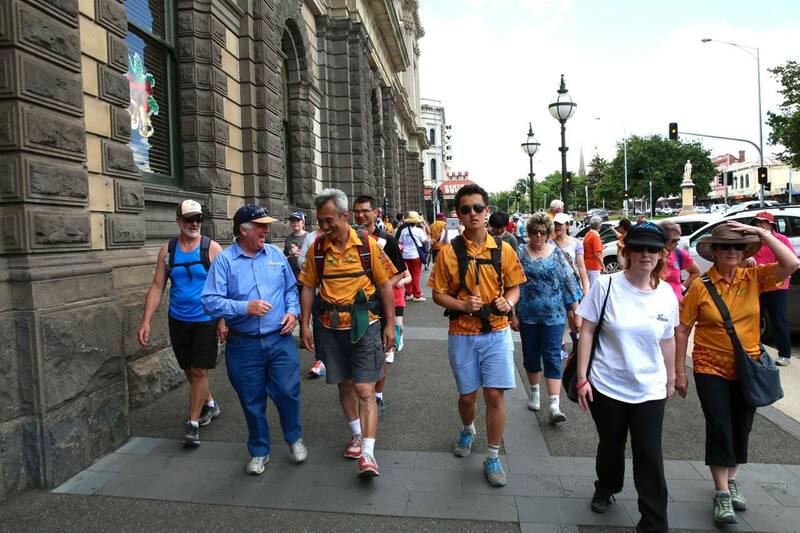 By Tuesday the 24th of December the trekkers had reached Ararat, the only city in Australia to be founded by Chinese immigrants. 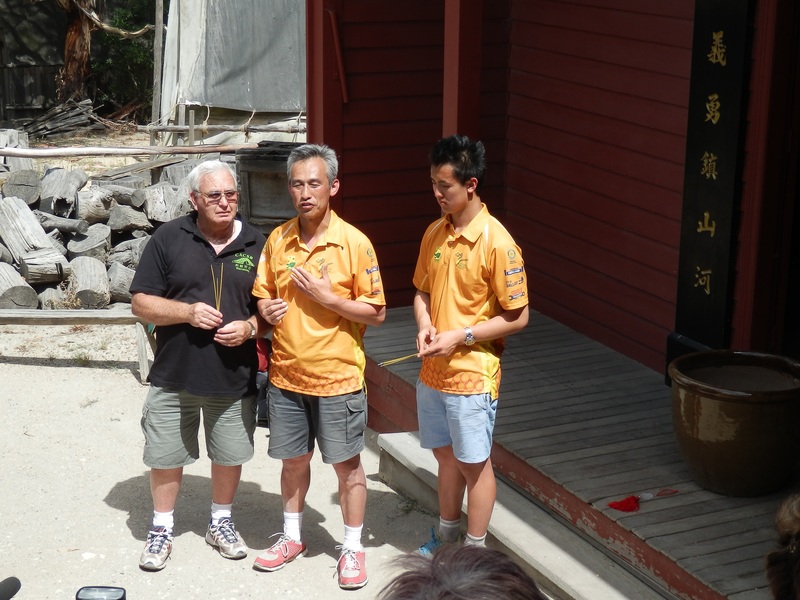 Charles and Oscar visited the Gum San Chinese Heritage Centre. It is built on the site of the “Canton lead”. Discovered by Chinese immigrants travelling overland to the Victorian Goldfields, the Canton lead yielded more than 3 tons of gold during the first three months of mining. 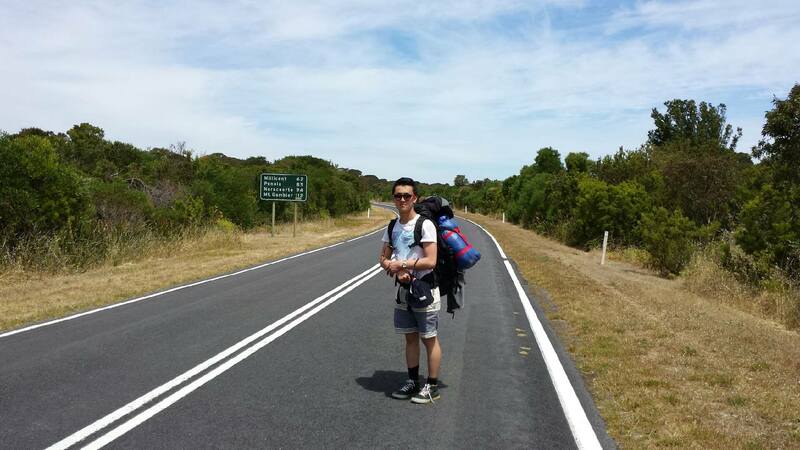 Christmas Day was spent on the road from Ararat to Buangor. Luckily Santa was able to find the walkers and bring them some Christmas cheer. They were also able to organise the use of Buangor’s hall so that Charles and Oscar could enjoy a family Christmas celebration. Mayor and people of beaufort in front of rotunda. Dulcie in centre. 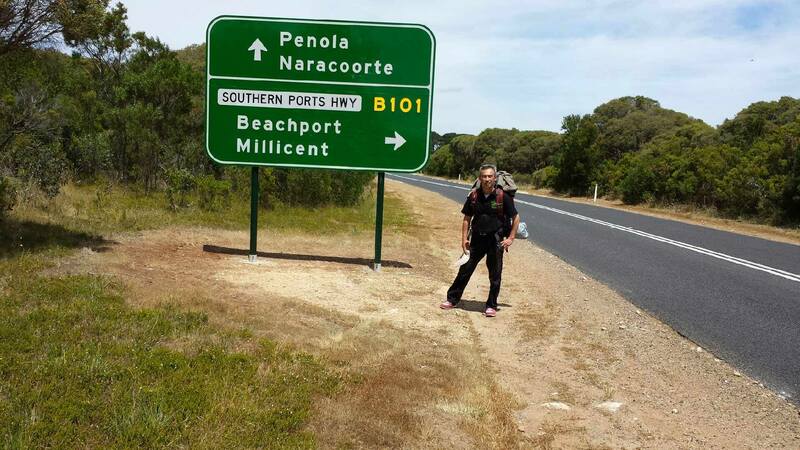 The next day our intrepid walkers ventured to Beaufort. Walking against Boxing Day traffic and the largest climb so far, they were accompanied into the town centre by the Mayor of Pyrenees Shire and the people of Beaufort, including 90 year old Dulcie. First public use of new freeway extension. No cars, yay! The next day the people of Beaufort also walked with the trekkers to the outskirts of town and wished them well on the rest of their journey. 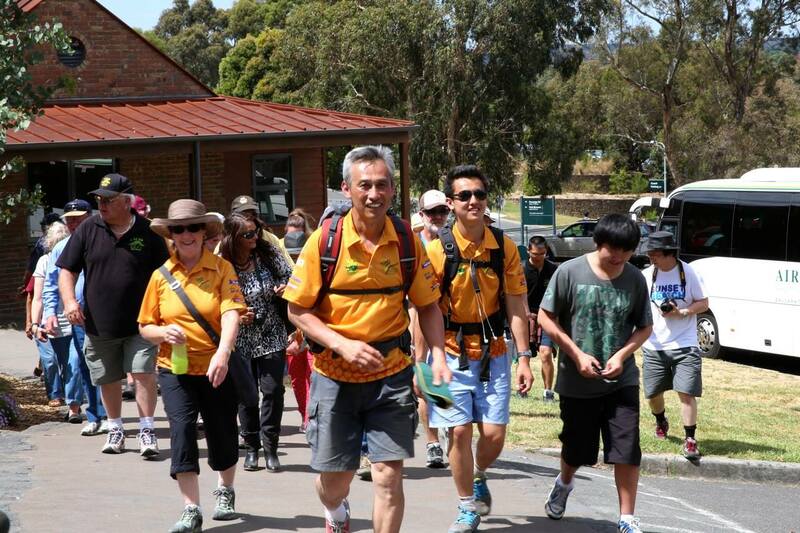 They were met by City of Ballarat Councillor Samantha McIntosh to walk with them to Burrumbeet. 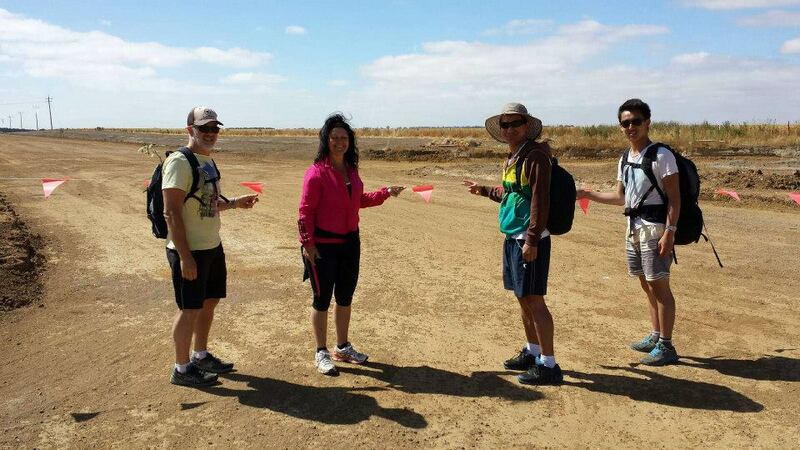 The group got to walk along the uncompleted extension of the Western Freeway. They quite liked the lack of cars. 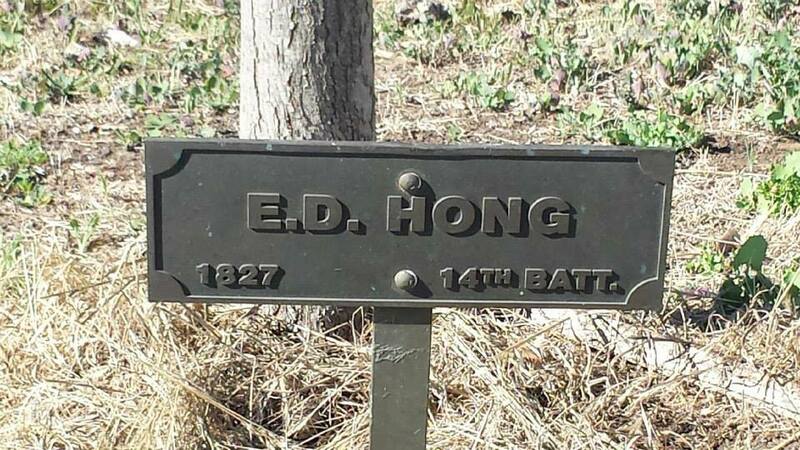 Chinese name on plaque along Avenue of Honour into Ballarat. Finally the last day saw our intrepid adventurers complete their journey, walking from Burrumbeet, down the Avenue of Honour and into Ballarat. 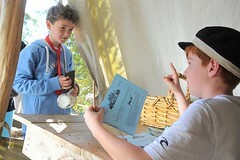 Surrounded by many supporters, the boys were welcomed at the Town Hall and then went on to complete their journey where it had begun, at Sovereign Hill. Well Done! Leaving Ballarat Town Hall to finish at Sovereign Hill. 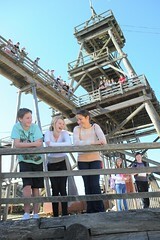 Walking up the steps to Sovereign Hill at the completion of the trek. 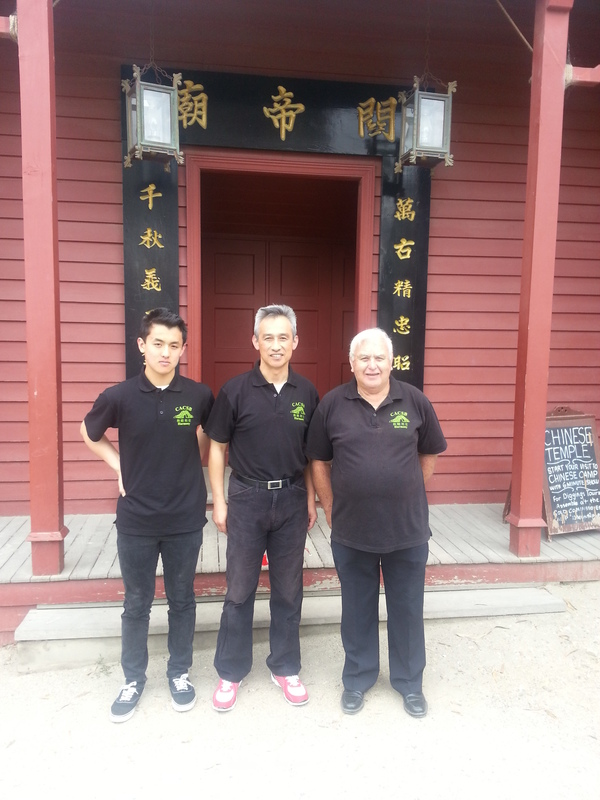 Charles Oscar and Bill back outside Sovereign Hill’s Chinese temple. Photo from Yvon Davis. 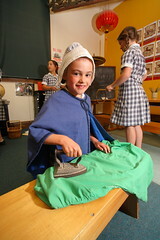 This entry was posted in History Teaching, Immigration, Sovereign Hill, Victorian Gold Rush and tagged Chinese, gold rush, historical recreations, immigration, local history. Bookmark the permalink. Is the walk from Robe to Sovereign Hill an annual event? I’m just doing some research for a documentary. For those interested in the History of the Chinese trek from Robe to the Victorian goldfields the historic fiction book Xiang and the New Gold Mountain is an interesting read. It follows the fortunes of two young Chinese men from their homes in China to the goldfields and home again. 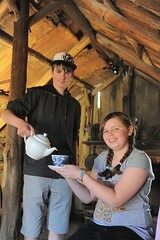 The book is available from the Gum Sang Chinese museum and interpretive centre, Ararat. There hasn’t been another book that covers this Historic event as accurately as Xiang.